If you’re a church-goer or member, have you ever thought about why you attend? Do you go simply because you were raised going to church and it’s a tradition or habit? Do you go for what you hope or expect to get out of it? Do you believe church attendance is for the most part a good thing, but not necessarily required of a believer? What about joining as a member of a specific local church body? The Scriptures teach that Jesus left heaven for one main purpose: to redeem a particular people, a group of specific individuals referred to in the New Testament as His bride or His church. The motivation for His doing so was love – a love that can be seen in the scriptures to be intentional, sacrificial, unconditional, and eternal, observes Earl Blackburn. And His love for the church continues as He “actively cherishes and adores, nourishes and feeds, protects and defends, purifies and makes holy, and faithfully prays and intercedes for His church.” There is, in fact, no love like that which Christ has for His bride. 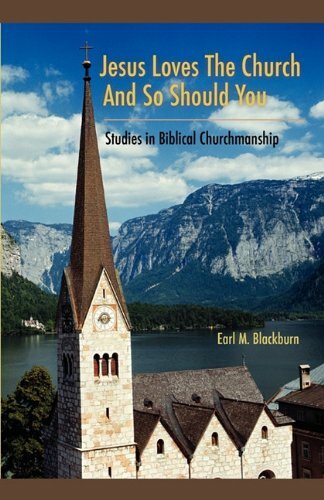 In Pastor Earl Blackburn’s valuable little book, Jesus Loves the Church and So Should You, he examines what the Bible (ie. Christ and the apostles) teaches about the purpose of the church, the importance and value of church membership, and the believer’s role, benefits, and responsibilities as a church member. Blackburn’s ultimate goal for his book is to lead the reader towards a Biblical understanding, appreciation, and love for the church and to encourage them to faithful and effective churchmanship as individuals, and to cause us to love the church just as Jesus loves it. In a discussion about the church, we must keep in mind that the term has two meanings. There is the universal, or invisible, church that represents the spiritual body of Christ of which all believers are part. This is not an earthly organization or entity, but a spiritual one. This indeed is the church that Jesus died to save. But the word church also refers to individual, physical, visible assemblies or congregations of believers that meet together for the corporate worship of God and the mutual edification of one another. To clarify, the church is not the building, but the believers who assemble in it. A church is a company of disciples, baptized on a profession of their faith in Christ, united in covenant to maintain the ordinances of the Gospel, and the public worship of God; to live godly lives, and to spread abroad the knowledge of Christ as the Savior of men. In this concise definition we see who makes up the church: baptized followers of Christ who have united together for the primary purposes and functions of the local church assembly, that is: 1) the worship of God, 2) the carrying out of the ordinances (baptism and the Lord’s Supper or Communion), 3) the building up and instruction of the people, and 4) the spread of the Gospel, or evangelism. A vibrant Christian life among its members; this includes the elements of spiritual worship, corporate prayer, regular fellowship, acts of charity and benevolence, and evangelism and missions. When a church fails to have these in place, it won’t be long before it will suffer and become weak and less effective for the cause of Christ and the good of its people. Unfortunately, when a church neglects some of these elements, or loses sight of the primary purpose of the church and becomes distracted with other concerns, it inevitably becomes more of a social club or a community outreach organization and ceases to be a true, Biblical church. A very good resource for further study on this topic is the organization 9Marks. After defining what a church is and what a healthy church looks liked, Pastor Blackburn discusses the subject of church membership. Some say that the New Testament doesn’t say anything about joining a church, so isn’t it good enough just to find a church you like and attend on a regular basis? However, Blackburn posits that the New Testament is replete with references that imply the existence of a form of membership within the individual church congregations. He identifies 24 “one another” verses in the New Testament, such as “be kind one to another,” “forgive one another,” and “comfort each other.” While the universal church is to love one another, etc. these passages address how individuals are to deal with each other on a personal, practical, day-to-day basis. Who then, does the “one another” refer to, other than the fellow members of the local church to which the author is writing? Also consider 3 John 1:10 which refers to putting certain individuals out of the church. Today’s postmodern believer views the Christian life, for the most part, independently of the body of Christ…Viewing the church through the lens of ‘”self” leads people to judge a church based on how well the church meets their personal expectations [or needs, I would add]…This type of individualism, of course, is undermining church membership. With a low view of accountability, Christians have begun to believe that church membership is optional; a good thing maybe, but not a biblical necessity. Many people are content to church hop their whole life, or simply stay at home. Option B is to go to the woods to worship God in their own way, or attend a church but never join it. Those who bypass the church, or merely interact with it on a casual basis, struggle all their lives…They are like the ember that is removed from the coals of fire. It will glow and give off heat for a very short while, but because of lack of attachment to the fire, it will soon grow cold and die out. You cannot expect to prosper spiritually if you disregard and remain unattached to that which God has ordained. Next Blackburn looks at the responsibilities, privileges, and blessings associated with church membership, then reviews the biblical criteria and process for joining a church, as well as the appropriate way to leave a church when it becomes necessary. If there is no love for Christ’s churches or no concern to be identified with a visible church, it may be you do not love Christ. Your faith is suspect. True and saving faith creates a love for Christ and the things He loves. And the church is what Jesus loves utmost. Jesus Loves the Church and So Should You is a book I’ve included on my list of non-fiction books I feel every Christian should read. Looking for a solid, Biblical church where you will hear God’s Word faithfully preached and will meet people who are serious about the things of God? Consider checking out the Association of Reformed Baptist Churches of America (ARBCA) to find a church in your area. What do you most love or appreciate about your church? This entry was posted in Christian Books, Non-Fiction and tagged Association of Reformed Baptists, church membership, Earl Blackburn, Jesus Loves the church. Bookmark the permalink.